I love the water. A place on the ocean is my ideal place to spend summertime. So it’s not surprising that I love all the water scenes, lighthouses, boats, fish, seashells, etc. on cards. 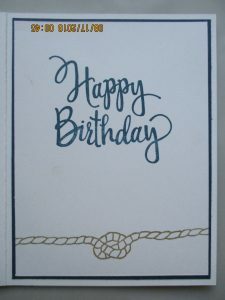 This birthday card uses the Seaside Shore set from Stampin’ Up. The rope on the inside of the card is actually two stamps. I think it took me as long to line it up as making all the fish!! Be sure and leave a comment if you have any questions about colors or products used. 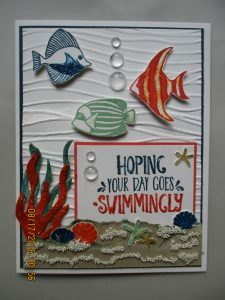 This entry was posted in Cards and tagged Seaside Shore, Stylized Birthday. Bookmark the permalink.